Two amazing things happened this week. Well, a lot more than that, but here are two I want to mention. First, a reporter from the Houston Chronicle called to interview me about my new picture book! Apparently there will be an article in their weekly Community section. I’ll post it as soon as it’s out. A photographer is dropping by this afternoon to take my picture … wow! Secondly, a writer named Paul McCrae posted a review of my book on his website called Artcar Nation. You can read Paul’s review here. I was flattered by his positive words, especially because he had a right to be skeptical. 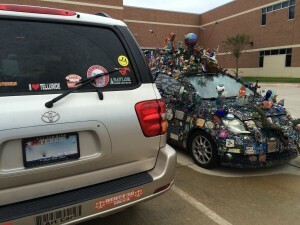 After all, I don’t drive an art car. Who is this random person sending me a children’s book about an art car? he must have thought. 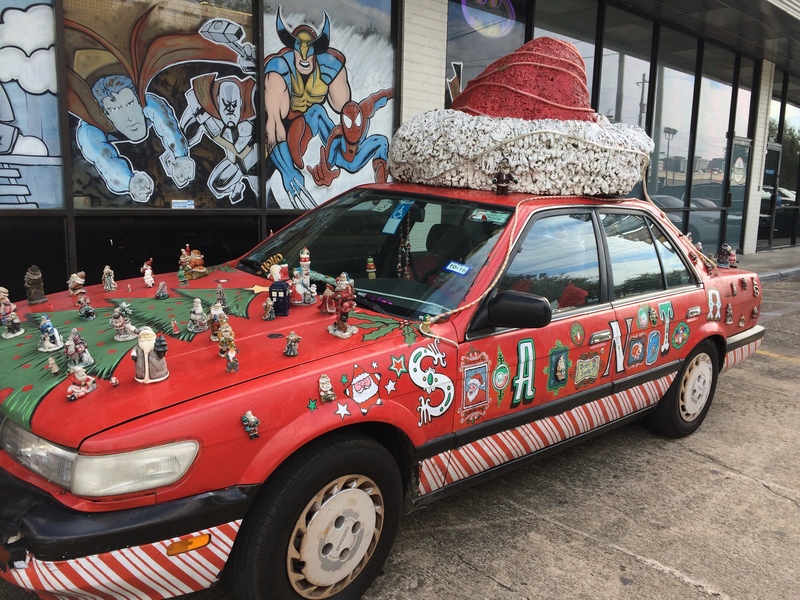 But what I want the art car aficionados to understand is that while they express themselves through their decked-out cars, I express myself by writing (regardless of the topic). Either way, each of us believes in and is proud of what we are creating. I’ve also made some new friends during this process of launching my book. 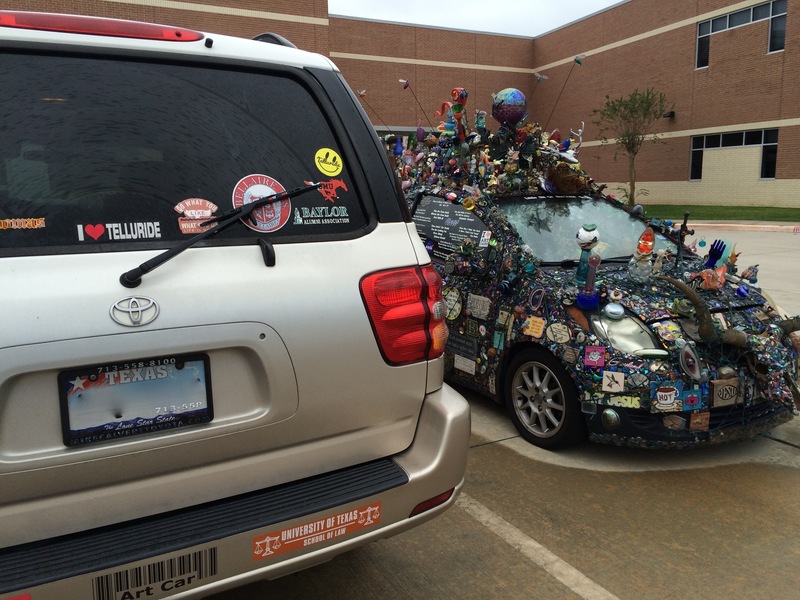 Like Randy Blair–a fantastic Texas chef/caterer as well as art car driver of “A Little Bit of Nonsense” (pictured here alongside my SUV!). Randy also sells handmade jewelry, is father to a whole bunch of kids (I forget how many! ), and a loving husband (he brags about his beautiful wife a LOT!). 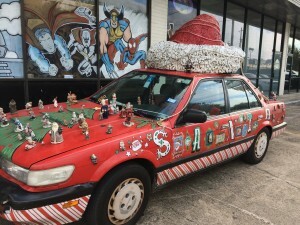 You can read about Randy Blair’s art car here! Well, Bryan, I don’t know if it’s one word or two, but I do know that I like art cars (aka artcars), and I am happy that this particular book idea popped into my brain last year! Otherwise, I would have never met you, Rev. Bryan Taylor; or my illustrator, Bill Megenhardt; or chef Randy Blair; or Sue Shefman, the owner of the hippo car named Cheerio; or Lennie Henry at the Orange Show; or Alicia Duplan at the Art Car Museum; or the fun people at City ArtWorks; or Stephanie Walton at Wilchester Elementary School; or Kristin and Laurie, the librarians at St. Mark’s Episcopal School; or Ellen Leventhal/Sheri Bernstein/Toby Haberkorn, and all the other Houston authors I’ve met through this process; or Mitch and Eduardo, my website gurus. There are too many new friends to name here, especially since I have a Houston Chronicle photo shoot to get ready for! But all of you know who you are. And if it wasn’t for my wacky art car book idea, I wouldn’t have met Mr. Arthur Zarr, for that matter, and he’s quite special to me. — Be Amazing!